We arrived at our first port in China this morning. Huang Pu is about 20 miles from Canton and about an hour and a half from Foshan. We were signed up for a full day in Foshan, so we ordered breakfast in our room again. Ray didn't sleep well last night and felt sick after breakfast, so I went on the tour without him. At first I thought it was overcast today, but our guide surprised me by thanking us for bringing sunshine. I didn't see the sun all day. What I thought were clouds was actually pollution haze. I didn't think we'd see that this far south. If this is what southern China is like, I'm afraid of what we'll see in Beijing. The bus ride to Foshan was uneventful. It reminded me of driving through New York City. There were a continual line of high-rise apartment and office buildings, many still under construction. 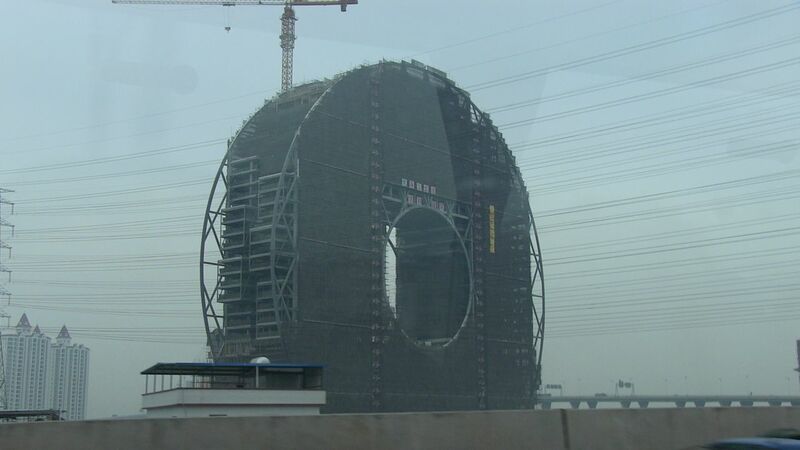 Circles are considered harmonious in China, as this new building shows. Holes are sometimes designed into buildings to allow dragon spirits to have a path from the mountains to the sea. 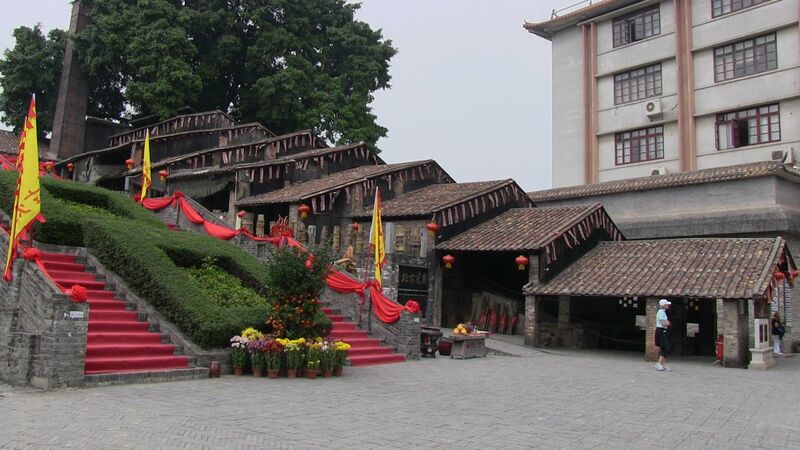 Our first stop was at Foshan Zumiao. 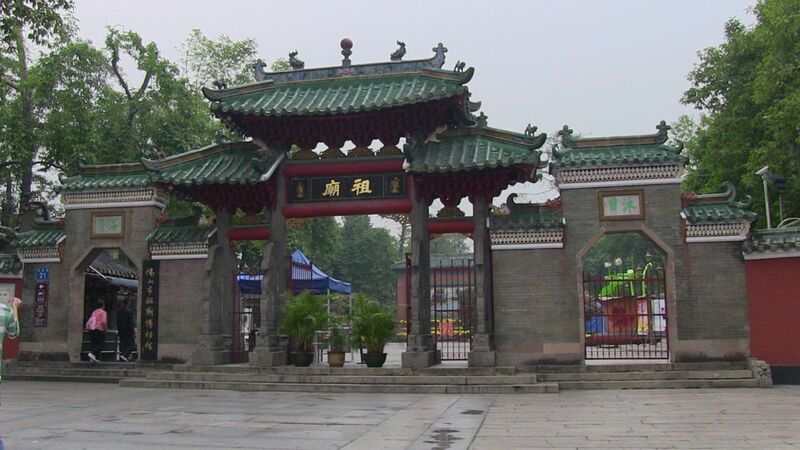 This is a Taoist "ancestral" temple complex. At least this is what the guide called it. From her explanation, I think when they say "ancestral", they mean historic site. This was an interesting place, with various small buildings and courtyards. In one courtyard, women in their 70's were performing Tai Chi exercises. When they were done they greeted us with a friendly smile and an English "hello". 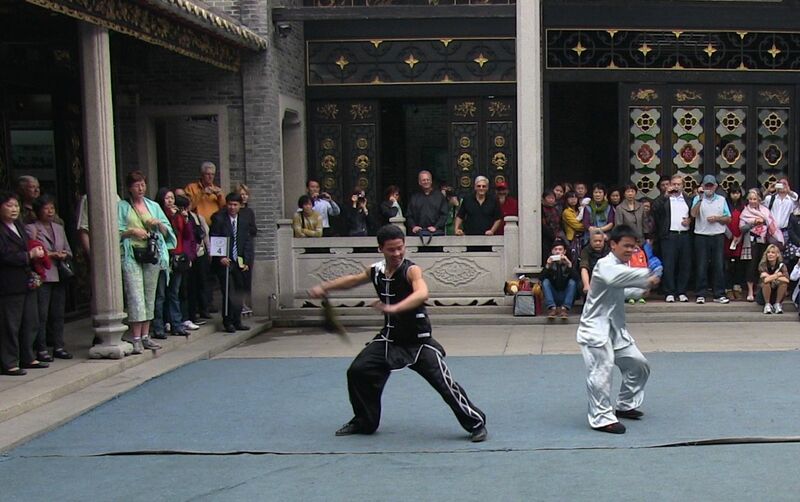 In one inner courtyard we stopped to watch young men perform a Kung Fu demonstration. I'm sure none of them were more than high school age. There were about a dozen young men demonstrating various skills and it was all very impressive. 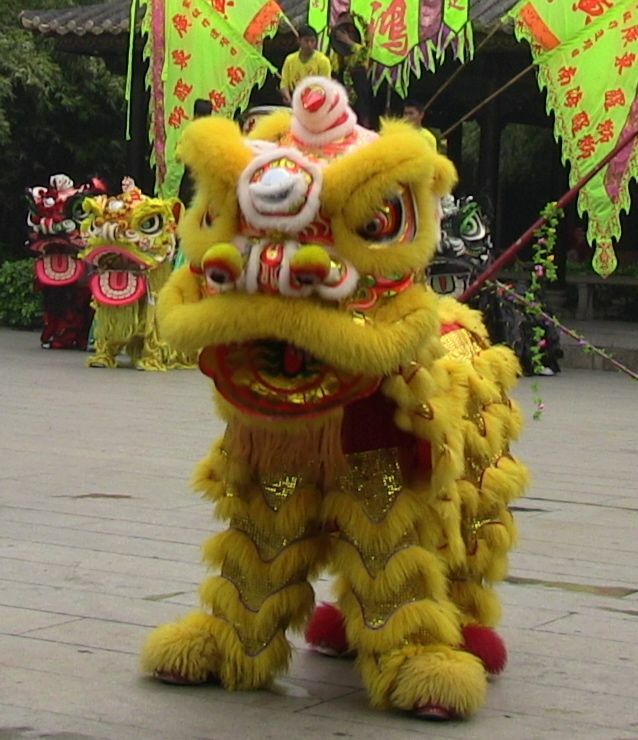 After the Kung Fu show our guide led us to another, open courtyard where we watched some young acrobats dressed in dragon costumes (2 boys in each dragon), dance and perform acrobatic stunts. At the end of the first part they came close to the crowd so children could pet them and adults could offer "tips" in exchange for good luck items. I placed $5 in a dragons mouth and received a good luck bell in return. 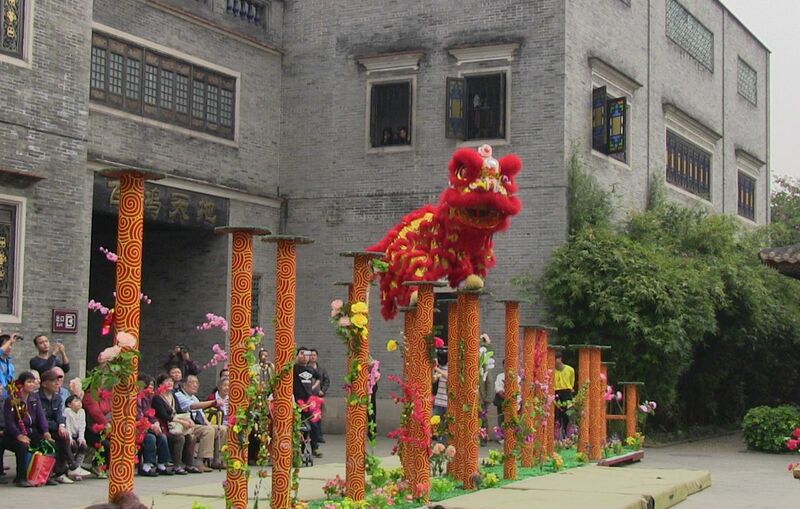 For the second part of the show one of the dragons performed acrobatics on the pedestals at one side of the courtyard. Note that the dragon is made up of 2 guys, one for the head and one for the rear. They must just from pedestal to pedestal in sync, with the costume in place, sometimes doing flips. Amazing stuff. Next stop was at a folk art store where they showed us how they teach children Chinese writing with a brush dipped in water (no ink). The paper is backed with something that makes it turn black with each water-brush stroke. We were given a little shopping time there. We stopped at a local restaurant for lunch, but almost wish we hadn't. They brought out lots of food, but only the vegetables, soup and rice were edible. They served pork, duck, chicken and beef, all of which had lots of fat on it. The chicken and a shrimp dish were undercooked and the fish had tiny bones in it. Needless to say, there was a lot of food left in the family-style serving dishes when we left our table. 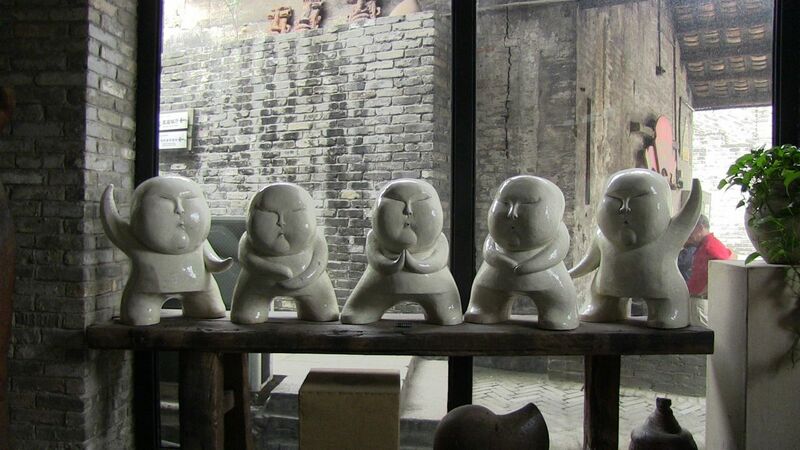 Our last stop was at a pottery artist community, with lots of little shops in historic buildings. The pottery was lovely, each shop showing the products of the artist/shopkeeper, but none of the shops took U.S. currency or credit cards. Very few of the people on the tour had a chance to get any local currency, so the browsing after the tour of the shops was short. Although all the stops were interesting, there was way too much time at each one. We seemed to have 15-30 minutes left at each place after we had seen everything but before the meet time the guide had set. The only place that accepted U.S. currency or credit cards was the folk art store, and they were obviously not used to handling credit cards. Each transaction took over 5 minutes, and that was with our guide standing there assisting. The tour was scheduled for 8 hours, but it could have been completed in under 7. After the long day we had another surprise waiting for us back at the ship. When we left the ship this morning we had to submit a stamped copy of our passport to immigration officers and they took our picture. On the way back we had to hand them the same copy so they could verify that the same person returned as left the ship. It wasn't a problem when we left this morning because the tour groups were staggered so everyone didn't leave at the same time. However, it seems like all the tours returned to the pier around the same time. There was a long line to get to the 5 Chinese immigration officers one at a time. The Regent staff must have expected this, because they had music playing and a number of crew members standing along the lines, clapping and dancing to the music to entertain us as we waited. I videoed this of course. There were a lot of people upset at the wait, but I was in no rush and I enjoyed the crew's efforts to lift our spirits. I saw a few stateroom attendants who I knew and I thanked them for being there for us. Ray was doing a little better when I got back, but still wasn't 100%. I ordered chef salads to the room for dinner so he could have more recuperation time. We sail for Hong Kong tonight and he really wants to see that city.